You can taste the salt in the air, the sea-spangled freshness that blusters across the green rise of the churchyard. You can sense the swell; and there it is, a leaden line stretching beyond the church, beyond the land, ceaseless, always changing. The sea is the handmaiden of Norfolk, her fortune and her fate. Given the wealth of this area in the 15th and early 16th centuries, St Nicholas is unsurprisingly perpendicular, but there are no walls of glass here; rather, the building rises to heaven flanked by narrow paired slits, a defence against the buffeting. The flintwork looks almost new, and so it must, for if it is not maintained it will soon succumb to the damp and the gales. 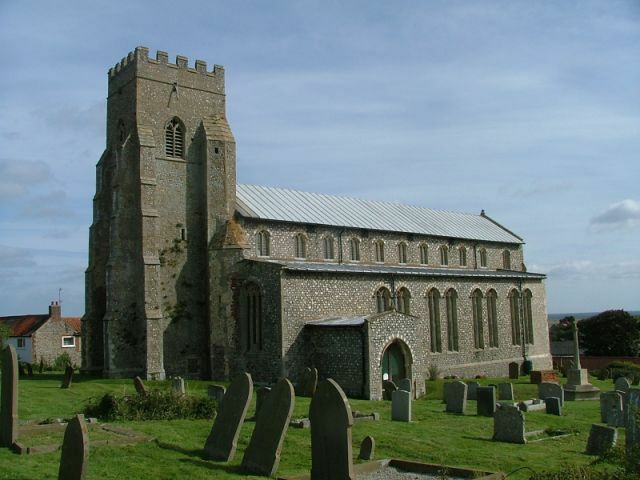 I was reminded of Blythburgh in Suffolk, another watery place; as there, they rebuilt the nave and chancel all in one piece, giving it flanking aisles and a clerestory; but the older tower survives, because protestantism intervened before it could be rebuilt. Perhaps it would all have been made more beautiful, with decorations and elaborations; as it is, what survives is very austere. Salthouse was part of the great port of Blakeney Haven, but this has long gone, and so have the people. Today, this is a lonely place. You step into an upturned boat full of light, again like Blythburgh; and there is something else that this place shares with Blythburgh, for both were to benefit from a commodity that was in short supply in the 19th century - sheer neglect. By the time we got around to restoring this place, we had moved on from the sacramental scouring that the Victorians lavished on the great majority of English churches. Tom and I came here on Historic Churches bike ride day 2004, and so we expected to find a few people on the premises, but in fact there were lots of them, busy setting up an art exhibition. I expect you are thinking that it was some display of oil and water-colour views of local cottages, but nothing could be further from the truth; the space was full of installation art, including two huge balloons floating up in the clerestory with a biplane buzzing between them. 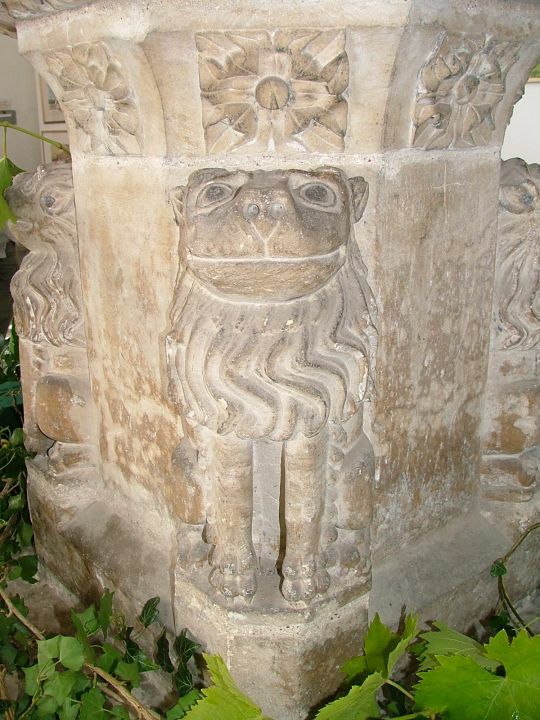 We had arrived just in time before the font disappeared behind foliage, so we were able to photograph Salthouse's famous cuddly lions; they smile in such a friendly way that you just can't imagine how a woodwose would have the heart to club them. I did wonder if they might have been recut, as the upper panels appear just a bit too sharp; nevertheless, these are also of great interest, featuring instruments of the passion and a Tudor rose alongside the symbols of the evangelists. Most of the screen was moved to the back of the church in the 1930s, which is liturgically ignorant, but makes it easy to study. Given this, it is curious that Pevsner and his later editor Bill Wilson misinterpreted it, recording it as bearing 'sixteen Saints'. MR James and Mortlock both hedge their bets and identify a few Saints who are holding their familiar symbols, but the reason that they were unable to identify the others is that they are not Saints at all. The figures are in pairs, and those on the left hand side of each pair on the south side (right hand figure of each pair on the north) are clearly identifiable as Saints, mainly disciples: St Andrew with his saltire cross on the first panel of the south side, for example, and St James with his pilgrim staff as the left hand figure in the next pair to the south. Intuitively, they should all be disciples, but one Saint, on the north side, appears to wear a crown, and carries a spear and sack. Who could this be? The other figures in each pair are quite different. They don't have halos, and they are dressed in 15th century clothes. In attitude, most are arranged to face their partnering Saint. They also have symbols of a kind, but more subtly; one holds a scroll, another a sack, a third counts on his fingers. So, who are they? I think they are donors. They are the living, breathing citizens of Salthouse in the 15th century who paid for this place to be built. Perhaps Pevsner can be forgiven for his confusion; perhaps it was a bleak winter's day when he came here. However, one portion of the screen, still up in the chancel, is much easier to decipher, being much less damaged. This consists of two pairs of figures, a Saint and a donor in each case again. The Saints are probably St Jude (with a halberd, although he may appear on the screen at the back with his boat) and St Simon (with a fish). But the other two figures are wholly secular, and the left hand figure is a woman. And both of them are doing the same thing - carrying a purse and holding up a coin, which seems to be fairly conclusive. 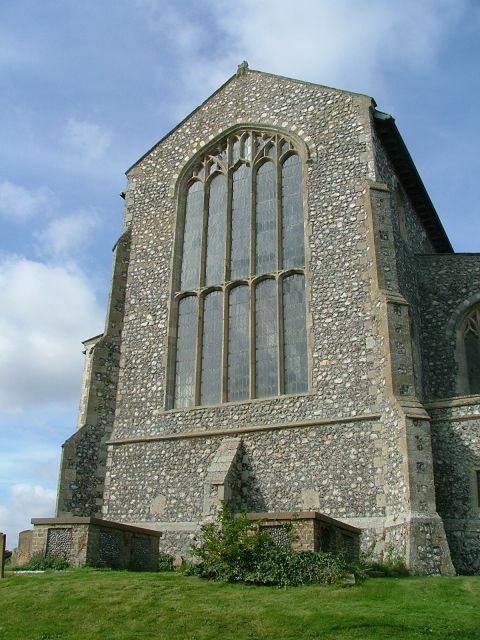 Assuming that the screen stretched right across the church, this must have been part of the parclose, perhaps to a chantry that remembered the souls of Sir Henry and Lady Heydon, who are generally credited with paying for the greater part of the rebuilding. So, perhaps this is them. This seems to me such an unusual and significant screen, I find it curious that it has not been better documented. Of equal interest are the great 16th century sailing ships scratched into the backs of panels at both the west and east ends - good to know those lengthy post-Reformation sermons weren't lapped up uncritically. What else? A chalice brass, a panel of continental glass depicting the Mass of St Gregory, the elevated host turning into the body of Christ; and more, a real sense of a building loved and used without any of the pomposity of neighbouring Cley. I liked it a lot.